Dr. Min Wu received a B.E. degree in electrical engineering and a B.A. degree in economics from Tsinghua University, Beijing, China, in 1996 (both with the highest honors), and an M.S. degree and Ph.D. degree in electrical engineering from Princeton University in 1998 and 2001, respectively. She was with NEC Research Institute and Signafy, Inc. Princeton, NJ, in 1998, and with the Media Security Group, Panasonic Information & Networking Laboratories, Princeton, NJ, in 1999. Since Fall 2001, she has been a faculty member of the Electrical and Computer Engineering Department and the Institute of Advanced Computer Studies (UMIACS) at University of Maryland, College Park. She is also affiliated with the Institute of Systems Research (ISR) in the same university. Dr. Wu's research interests include information security and forensics, and multimedia signal processing and communications. She has published one book "Multimedia Data Hiding" (Springer-Verlag, 2003) and about 65 refereed journal and conference publications. She holds four U.S. patents on media security. Dr. Wu is a member of the IEEE Technical Committee on Multimedia Signal Processing and on Multimedia Systems and Applications. She has served as publicity chair for 2003 IEEE International Conference on Multimedia and Expo (ICME'03), finance chair for 2007 IEEE International Conference on Acoustic, Speech, and Signal Processing (ICASSP'07), and in the technical program committees of several international conferences on multimedia, signal processing, communications, and information security. She also co-edited a Special Issue on Multimedia Security and Rights Management for EURASIP Journal of Applied signal Processing in 2004. 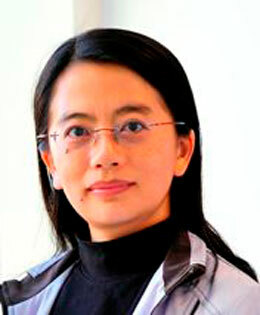 Dr. Wu received an NSF CAREER award on information security and protection in 2002, and a George Corcoran Education Award from University of Maryland in 2003, a 2004 Best Paper Award from the EURASIP Journal of Applied Signal Processing, and a Young Investigator award on multimedia security and forensics from U.S. Office of Naval Research in 2005. In 2004, she was selected by the MIT Technology Review Magazine as one of the 100 top young innovators whose contribution to emerging technologies will profoundly influence the world. IEEE Fellow, Class 2011, for contributions to multimedia security and forensics. University of Maryland Distinguished Scholar-Teacher, an honor for excellence in research and teaching, 2013. 2012: Innovator of the Year Award (The Daily Record); and Invention of the Year Award (Univ. Maryland). 2007: Computer World "40 under 40" Young IT Innovator Award. 2005: U.S. DoD ONR Young Investigator Award (YIP), 2005. 2002: U.S. NSF Faculty Early Career Development Award (CAREER). IEEE Signal Processing Society Best Paper Award (2005); and EURASIP Best Paper Award (2004). For two journal publications in multimedia and forensics. Best Student Paper Awards, ICASSP 2005 and ACM Multimedia 2011, with student coauthors. 2009: IEEE Mac Van Valkenburg Early Career Teaching Award. 2009-2010: Robert Kent Junior Faculty Teaching Award, College of Engineering, Univ. Maryland, College Park. 2003: George Corcoran Faculty Education Award in electrical engineering. R. Garg, A. Hajj-Ahmad and M. Wu, “Geo-Location Estimation from Electrical Network Frequency Signals,” IEEE ICASSP, to appear May 2013. Wu was selected for distinguished contributions to the field of signal processing, particularly for multimedia security and forensics. The award was established in 2003 to recognize outstanding academic performance of self-financed Chinese students abroad. Dr. Wu's invention can be used in a variety of applications including security and forensics, digital humanities and immersive multimedia. Exemplary service and leadership garner IEEE award for Clark School Professor. Applications of innovative resesarch include security and forensics, digital humanities and immersive multimedia.